Eric Staudenbauer knows...where the bodies are buried!!! 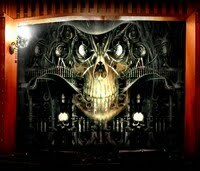 Mr Skull N Roses: Welcome, Eric, to our site! We are glad to have this opportunity to speak with you. How is your day going, brother? 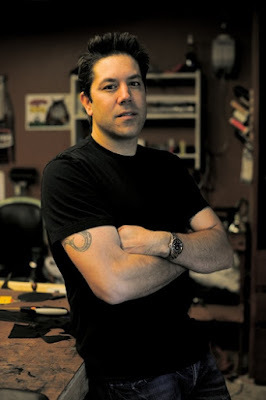 Eric (Stout Leather): Thank you so much for having me on your blog! Today ended on a good note, deadlines were met, meetings were productive, and I love what i do! 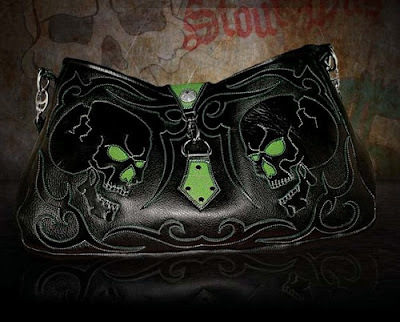 Mr Skull N Roses: There is much to know about the leather and silver industry and its development over the years. Leather works and silver jewelry are joined at the hip and inseparable. You have been an important part of this movement for the last 16 and have worked for some of the industry's pioneers. 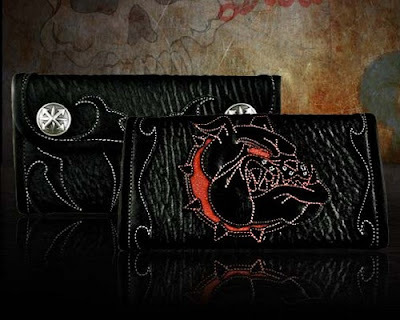 Mr Skull N Roses: When did your passion and creativity for leather works and this industry begin? How does Malibu play a part in all of this? Eric (Stout Leather): Growing up in Malibu was a awesome experience, in the early to late 80's was the explosion of "Locals Only" surfing to protect your local break. With that came the legendary band, Surf punks, and the infamous Runman surf videos. Then, there was Bill Wall paving the the way to becoming a true pioneer in the leather and silver game. Also, in this shop was future hell man and a legend in his own right, Travis Walker. 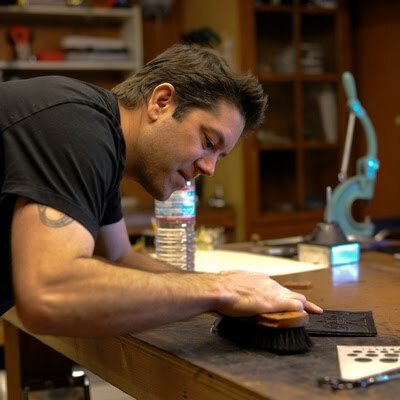 Travis and I became really good friends and I was always fascinated by the work they did. One day Travis and I were chatting away and he mentioned that they needed help do to a big order, so I jumped at the opportunity. This was back in 1993. At that time, I was doing sound work in hollywood for television and films, but a chance to learn this craft was way more inciting to me...and I haven't looked back since. I will always be grateful for those guys teaching me this craft that I love so much. Mr Skull N Roses: What is like being an artist in this field? What experiences do you remember most? Eric (Stout Leather): I feel very fortunate to be an artist in this field, I really enjoy constantly thinking about my next project and how I can make it better than the last, always evolving to be the best that I can be. The experiences that I remember and enjoy the most are the pleasant and blown away reactions I get from clients. When I do custom pieces, I ask them to give me a basic idea and to let me run with it. I show them a sketch and they are super excited. Then I show them the final product and they are even more excited! Exceeding ones expectations is a huge complement to the artist. 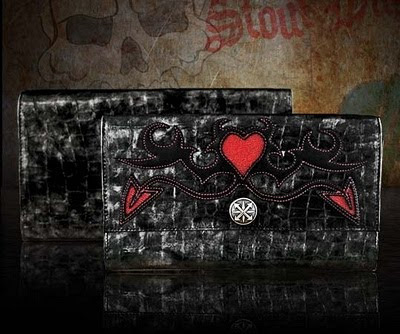 Mr Skull N Roses: Your wallets are stunning! Many people have no idea the amount of time and creativity involved in creating a beautiful leather piece. Can you describe the techniques that you utilize which makes your leather products so unique and eye-catching? What kind of machinery and materials are used to create your pieces? Mr Skull N Roses: Trade secrets...like where the bodies are buried! What inspires you to come up with your designs? 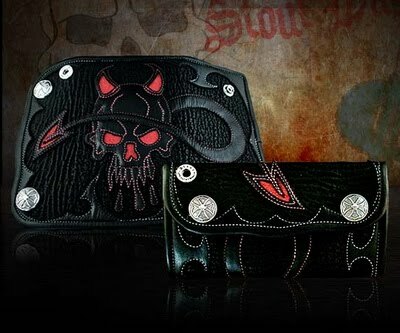 Eric (Stout Leather): I'm inspired by all kinds of art and cultures, I love skulls and all the different variations you can play with them. I really think they are timeless, but I absorb everything in life and art and just try to put my twist on it. Mr Skull N Roses: Your leather jackets are sick! What kind of custom work have you done for clients? How long does it take to create a custom leather jacket? 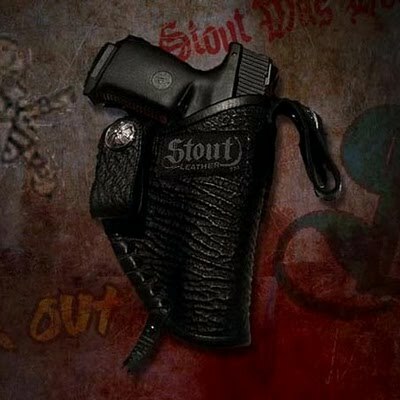 Eric (Stout Leather): Thanks again! There is a two to three week wait time at the moment for garments. 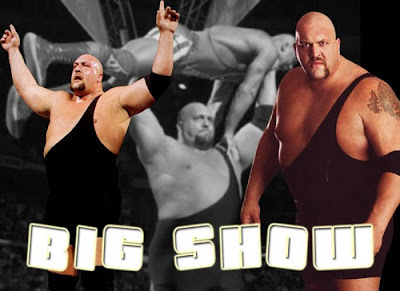 I did this custom short sleeve, baseball type, jacket for WWE super star, The Big Show. This jacket sticks out in my mind because he is 7+ feet tall and weighs 500+ pounds; it took 55 square feet of leather. I had to make it based on a shirt he mailed me to get the size. The back made for a great size canvas for me to do the art which was a dragon inlayed with shark and stingray. In the end, it fit him perfectly and that was a huge sigh of relief because you don't want a giant mad you!! Mr Skull N Roses: I would be thrilled to receive every item in that photo! 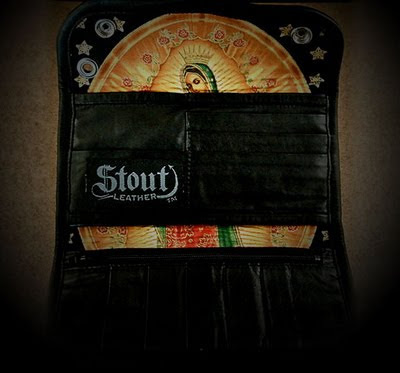 Where can our leather fans purchase Stout Leather? 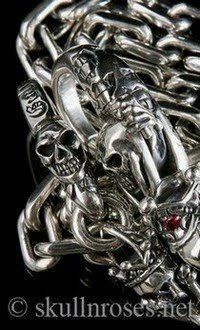 The "Stout Cross Jumper" bracelet is beautiful...any plans for a Stout Silver collection? Eric (Stout Leather): At the moment, you can purchase my products at my website, www.StoutLeather.com. I am working on stores and distribution, and any dealer inquiries are definitely welcome, nice plug huh!?! Thanks for the props on the bracelet and, yes, there is a full line of jewelry in the works. Just finished two styles of wallet chains, two new skull rings, and a lot more is coming. I will definitely keep your readers up-to-date and will send pictures as they get completed. 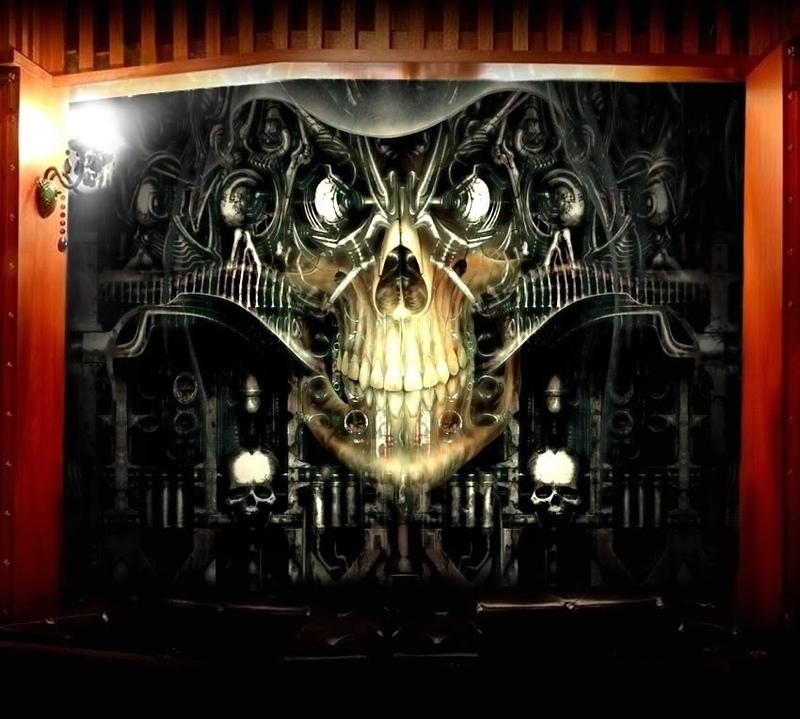 Mr Skull N Roses: Thanks for your time, bro, we wish you the best for 2010! 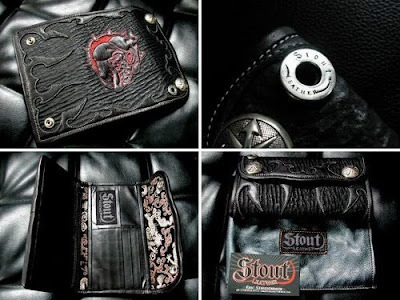 Eric (Stout Leather): My pleasure! May 2010 bring you everything you wish for! Cheers!! !